I have just added 5 new patterns to my website. Most of them were designed in the summer last year and the final pattern development was completed just before the holidays. This brings me to 22 new patterns published in 2016! 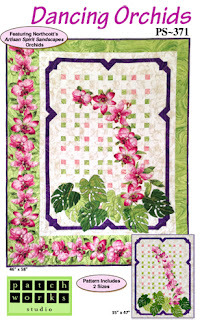 Dancing Orchids combines piecing and appliqué - but you don't need to make the orchids! They are 'fussy cut' from the orchid print in the Artisan Spirit Sandscapes Orchids collection by Northcott and then fused in place. This pattern includes 2 sizes: you can add the asymmetrical border for the large quilt (46" x 58") or make the smaller quilt (35" x 47") without the border. I have included one of my favourite appliqué shapes in the quilt too - the Monstera leaf. I have used this design for my Machine Quilting with Decorative Stitches workshop and as a quilting design. On the Move: I have wanted to make this pattern for a couple of years. It is based on the wedding quilt I made for my daughter and son-in-law in 2014. I just had to wait for the perfect fabric. Hipster on the Go by Northcott was just what I was looking for! This pattern has 2 sizes and 2 colourways. 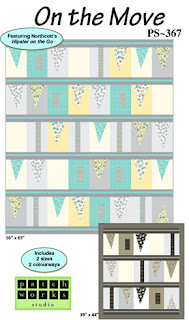 The large quilt is 56" x 65" and the small quilt is 39" x 44" (perfect for a baby quilt). Give & Take Appliqué pattern (one fused design equals TWO blocks). This Holiday Bells table runner is 18½" x 48". It's NOT too early to get started on a holiday project for 2017! I had a lot of fun working with panels for the next pattern. 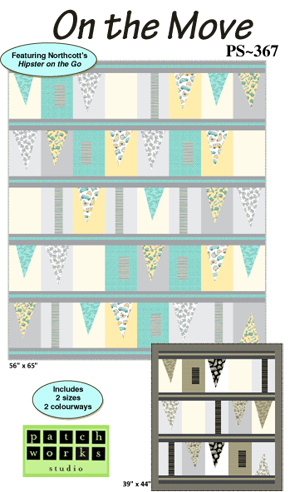 Yes....this quilt uses 2 of the same panel so you don't need to do all that amazing piecing! I cut the panels into sections and recombined the pieces with 3 coordinating fabrics to make this 59" x 67" quilt. 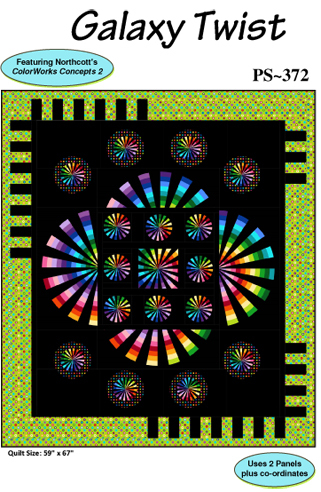 The Psychedelic panels are from the ColorWorks Concepts 2 collection by Northcott. I called this design Galaxy Twist. And the last pattern is one for the golfers in your life. 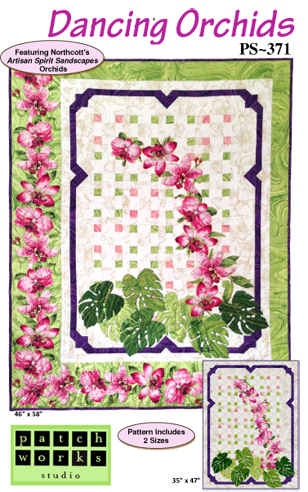 A great collection of prints called On the Green make this quilt lots of fun. There is a golf course scene, golf balls on the grass and golf clubs and golf bags and shoes. There is a fun allover print with 'tees' as well. 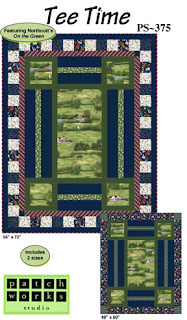 Two sizes are included in this pattern - large quilt 56" x 72" and small quilt 48" x 60". Piecing is very easy for these quilts and they make a perfect gift. What else could I call it? Tee Time! 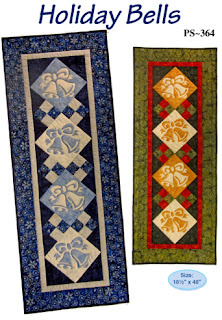 Want to see larger pictures of these quilts - 'click' the small quilt image in the store when you follow the links above.